Cardiovascular disease (CVD) mortality has decreased over the last decades, largely because of the progress that we have made in our understanding of major modifiable factors contributing to its etiology such as smoking, hypertension and high cholesterol levels. By targeting smoking cessation, cholesterol lowering by drugs and diet and by detecting and managing hypertension, we have had a favourable impact on important drivers of CVD risk . In addition, improvements in our ability to detect CVD and better acutely manage its clinical manifestations by medical procedures and therapies have reduced CVD mortality. However, it is important to keep in mind that despite this reduction in CVD mortality, CVD morbidity remains high . Thus, our current medical approach to CVD has been to develop better therapies to manage cardiovascular clinical outcomes, shifting CVD mortality to CVD morbidity. Over the same period, an expanding proportion of our population has become more and more physically inactive or has even been completely sedentary while the quality of our diet has decreased with an overconsumption of highly processed, energy-dense foods . As a consequence, the prevalence of overweight/obesity has increased. Being overweight/obese in North America has now become the norm rather than the exception. Because of these worrying observations, the American Heart Association has aimed to improve cardiovascular health of the nation by 20% until 2020 . To do so, they needed to develop simple criteria to define cardiovascular health. Seven criteria have been proposed: three biological risk factors (normal untreated cholesterol, blood pressure and glycemic levels) and four lifestyle indicators (nonsmoking, normal body mass index, physically active lifestyle, healthy diet) . This definition of ideal cardiovascular health constitutes a paradigm shift as it focuses on cardiovascular health rather than on CVD. Thus, cardiovascular health implies moving the target from primary prevention (identifying and treating CVD risk factors to avoid a first CVD event) to primordial prevention (to avoid the development of these CVD risk factors at the first place in order to maintain optimal cardiovascular health) (Figure). 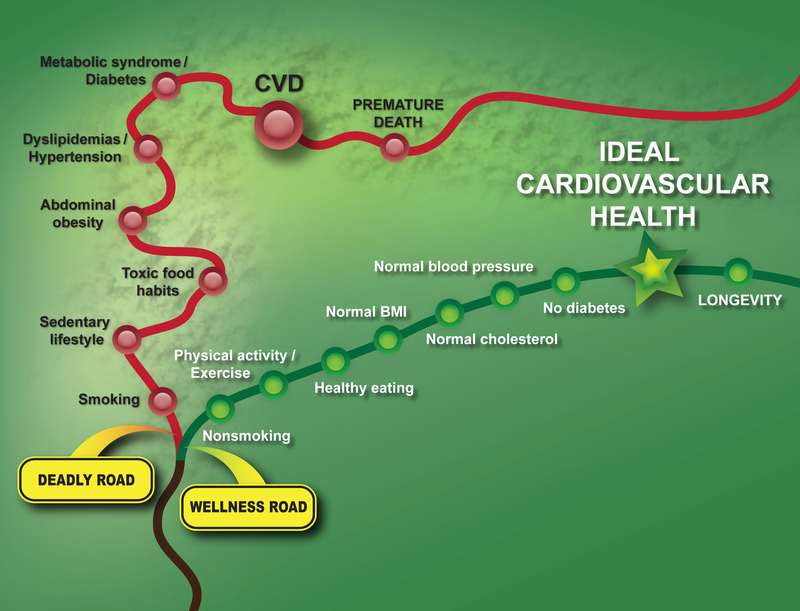 Figure: The roads to cardiovascular disease/health. Following the development of this concept, the prevalence of ideal cardiovascular health in the American population has been quantified in several studies. Bambs et al. reported that only one out of approximately 2,000 individuals studied in their cohort had an ideal cardiovascular health. In the ARIC study, a dismal proportion of the population had an optimal cardiovascular health (0.1%) and therefore was in primordial prevention . It is important to point out that among individuals meeting all criteria of ideal cardiovascular health, no cardiovascular event occurred during the 20-year follow-up of the study. However, subjects not meeting any of the seven targets of ideal cardiovascular health were at 10-fold increased risk of cardiovascular events compared to subjects with six indices of cardiovascular health. Finally, in the National Health and Nutrition Examination Survey (1999 to 2002), approximately 1.5% of participants met none of the seven ideal cardiovascular health indices while only 1.1% of participants met all seven indices . There was an inverse relationship between the number of ideal indices and all-cause mortality and diseases of the circulatory system. Compared to participants who met none of the ideal indices, those meeting ≥5 indices had a reduction of 78% in the risk of all-cause mortality and 88% in the risk of mortality from diseases of the circulatory system. On the basis of the very low prevalence of individuals with ideal cardiovascular health, it is easy to figure out that even a small shift in the right direction in this prevalence number would have a tremendous impact on the CVD health of our population. However, to achieve this objective, we will need to go beyond the traditional medical model and make healthy behaviours the obvious and easy choices for our citizens. The International Chair on Cardiometabolic Risk is committed to primordial prevention and to targeting ideal cardiovascular health. The challenge is huge but the consequences are not trivial for the cardiovascular health and quality of life of our populations as well as for the productivity and financial health of our nations. Mozaffarian D. Achieving cardiovascular health: a bleak outlook or tremendous potential? J Am Coll Cardiol 2011; 57: 1697-9. Bambs C, Kip KE, Dinga A, et al. Low prevalence of "ideal cardiovascular health" in a community-based population: the heart strategies concentrating on risk evaluation (Heart SCORE) study. Circulation 2011; 123: 850-7. Folsom AR, Yatsuya H, Nettleton JA, et al. Community prevalence of ideal cardiovascular health, by the American Heart Association definition, and relationship with cardiovascular disease incidence. J Am Coll Cardiol 2011; 57: 1690-6. Ford ES, Greenlund KJ and Hong Y. Ideal cardiovascular health and mortality from all causes and diseases of the circulatory system among adults in the United States. Circulation 2012; 125: 987-95.